This was the opening statement of celebrity marathoner Kuya Kim Atienza when he hosted the official launching of I-Cycle 2016: Ride Pilipinas at the ELJ Bldg., ABS-CBN Compound in Quezon City. 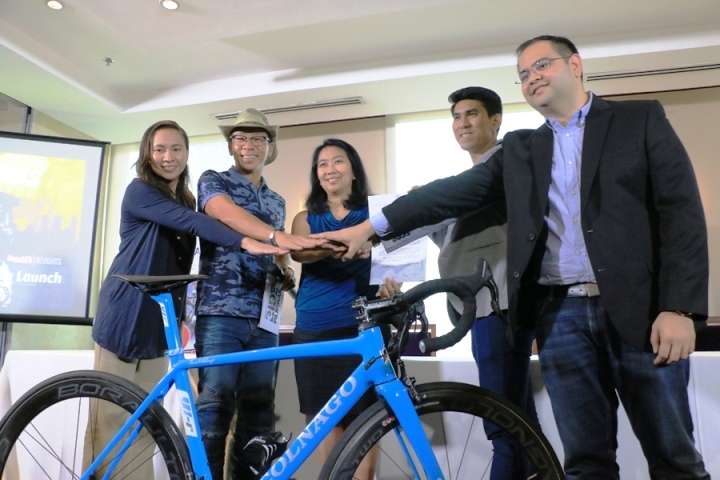 (L-R) ALKFI Bantay Kalikasan Program Director Jen Santos, Bicycle and Motorcycle Enthusiast Kim Atienza, ALKFI Chief Finance Officer Noemi Samson, Republik Brand Communication, Inc.'s President and Chief Creative Officer Michael de Leon, and Republik Brand Communication, Inc.'s Director Jeffrey Sonora sealing the partnership with the new Colnago bike model. Philippines can be said as a dangerous place for two-wheel riders. Motor and bicycle accidents are recognized as one of the leading causes of death in the country. The World Health Organization’s May 2016 report stated that half of those dying on the world’s roads are “vulnerable road users”: pedestrians, cyclists and motorcyclists. These issues led Republik Brand Communications Inc. to stage an event dubbed as I-Cycle 2016: Ride Pilipinas, a gathering of motor riders, bikers and biking enthusiasts in one venue to say in one loud voice that motor and bicycle have rightful lanes in the roads of not only Metro Manila, but of the entire country. It is a convergence of the staunch supporters of the cycling industry to break the connotation associated with biking, and to transform it into a positive message that biking is truly the solution to congested traffic in the main roads of Metro Manila. I-Cycle pushes for three major advocacies: 1. Road Safety; 2. Health and Wellness and; 3. Protection of the Environment. During the event, known experts in the industry will dispel myths and ignorance about cycling by sharing their best practices and ethical standards when riding motor or bicycle. Twenty thousand petition forms will be filled-up by guests and participants to reinforce their commitment to respect and to observe bike lanes, to pledge proper maintenance of motorcycles and to promote safety driving. Top three groups that will come up with the most number of signed petition forms will have the chance to champion their own advocacies through cash prizes. I-Cycle 2016: Ride Pilipinas also pledges to support the sixteen (16) ecotourism provinces currently managed by Bantay Kalikasan, the environment arm of the ABS-CBN Lingkod Kapamilya Foundation, Inc.
“When you ride your bikes, you become our fellow warriors. We in Bantay Kalikasan believe that our country is so blessed with natural resources. In fact we have started putting up Community Health Gardens in our sites. Thank you for providing opportunities for those who are neglected. You should stand proud that as you ride your bikes, riding with you are the people of Bantay Kalikasan,” Bantay Kalikasan Program Director Jen Santos articulated. I-Cycle 2016: Ride Pilipinas is also paying tribute to notable personalities such as the late Maico Buncio, who was awarded the Golden Wheel Awards’ Driver in 2011 and Marella Salamat who took home the gold medal in 2015 Southeast Asian Games. Her rigorous training in cycling led Salamat, who used to struggle as an overweight, into becoming a fit and professional cycler. “As a member of the motorcycle and biking community, riding is the closest to my heart... We partnered with ABS-CBN Lingkod Kapamilya Foundation, Inc. because we believe that we share the same vision and that is to promote road safety, health and wellness and protection of the environment,” Republik Brand Communications, Inc. President & Chief Creative Officer Michael De Leon expressed. On November 20, different groups of cyclists and motor riders are going to occupy and traverse the bike lanes of EDSA all the way to World Trade Center for Live to Ride 2016 – A Unity Ride. It will be a fusion of motor riders and cyclists passing through the busiest road of Metro Manila, a testament of harmony and assertion of their rightful spot on the roads. I-Cycle is part of Republik Brand Communication Inc.’s series of events in partnership with ABS-CBN Lingkod Kapamilya Foundation, Inc. from 2016 until 2017. This collaboration endeavours to empower different sectors, like motor riders and cyclists, for their voices to be heard by the entire nation. Small and medium entrepreneurs’ artistic customization of motor and bikes will be featured during the event. Never before seen customized bikes by celebrities and personalities will be displayed on the event. Nathaniel Flores of Italjet / Ducati, Dale Rosales of Colnago Manila and Philip Dantes of MotoItalia showcased samples of their motorbikes and bicycle during the launch. I-Cycle 2016: Ride Pilipinas unfolds on November 18-20, 2016 at Hall D of World Trade Center, Pasay City. Entrance is free-of-charge. Loot bags filled with exciting goodies await guests.For more details, visit www.ieventsorg.com. Click this link:https://www.facebook.com/abscbnfoundationkapamilya/photos/?tab=album&album_id=1114915668564892 to view more pictures during this event.